BP Aero supports airlines, engine owners and leasing companies with cost effective solutions to maintain the serviceability of their commercial aircraft engines. Our OEM trained A&P staff has extensive experience with engine inspections, engine preservation, top/bottom case repairs, module swaps, QEC/LRU install & removal and more. We are a cost effective solution over larger engine MROs who may be focused on engine overhaul rather than catering to minor hospital shop workscopes like BP Aero. Another benefit of BP Aero’s services is the fact that we understand the importance of being able to react quickly when a requirement is needed. BP Aero’s independently owned, 100,000 sq. 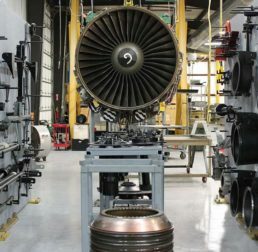 ft. facility was designed to maximize space and efficiency for aircraft engine repairs and storage. With the help of BP Aero engineering staff, engine rack systems were designed and installed to allow for storage of 40+ engines occupying less than 10% of the available production floor space. Our 10 ton, eight (8) bay monorail system prevents our customers from waiting in line before their engine is inducted for work. Being strategically located on the perimeter road of Dallas/Fort Worth Airport and centrally located in the middle of the United States allows our customers for quick and easy access to have their engines spend less time on the ground and more time in the air.